Next month, Connecticut will officially record its largest budget reserve in a decade — but $1.2 billion doesn’t go as far as it used to. 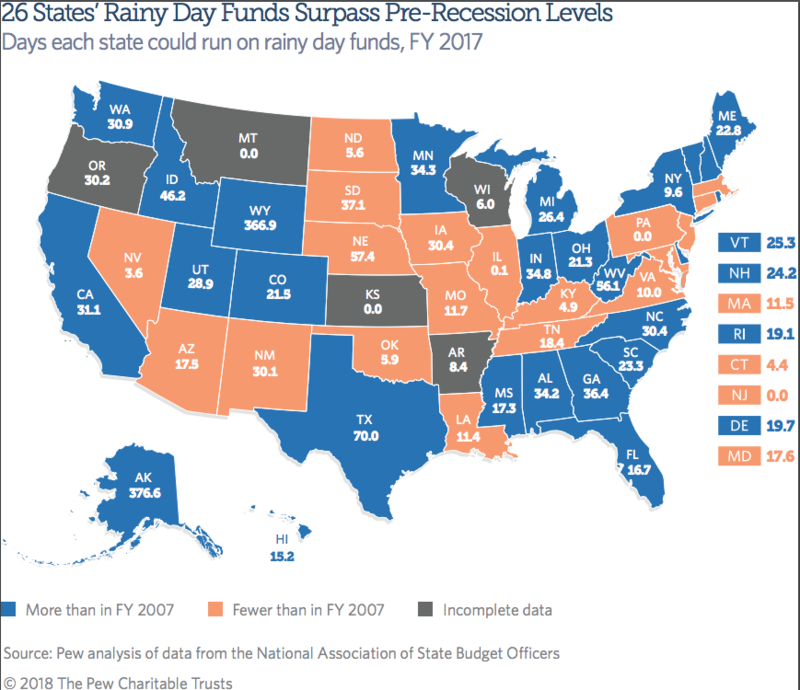 According to a new analysis of all states’ rainy day funds released this week by the Pew Charitable Trusts, Connecticut’s reserve would leave it in the middle of the pack, when it comes to readiness for the next economic downturn. But that’s still a far cry from where Connecticut stood one year ago, when its fiscal cushion was barely enough to keep government operating for four days. Fonfara has been one of the legislature’s most vocal advocates for new budgetary controls to force better savings habits. The emergency reserve is a state’s first line of fiscal defense against tax increases when revenues fall during a recession. 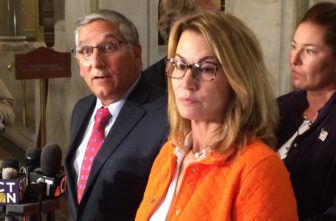 But Republican lawmakers also have been pressing for these and other fiscal controls, and House Minority Leader Themis Klarides, R-Derby, said it’s no mistake that as the GOP drew close to parity with Democrats in the legislature, change happened. What happened in April was a huge surge in state income tax receipts, most tied to capital gains, dividends and other investment-related earnings. A new volatility cap that legislators from both parties enacted last November barred state officials from touching the bonanza this spring and summer. Even though the 2017-18 fiscal year ended on June 30, the excess income tax receipts can’t be touched until Comptroller Kevin P. Lembo closes the books on the last budget on Sept. 30 — after which those dollars will be deposited in the rainy day fund. When that happens, Connecticut’s current reserve — about $213 million or an amount equal to 1.2 percent of annual operating costs — is projected to reach $1.15 billion, or 6 percent. According to Pew, Connecticut’s reserve after the 2016-17 fiscal year ranked seventh-lowest among all states as a percentage of its operating budget. Based on preliminary numbers for 2017-18, Connecticut not only exceeds the 5.6 percent national median, but ranks in the middle, at 24th highest. Connecticut has a history of not saving extensively for economic crises. Until the early 2000s, the legislature never permitted the reserve to top 5 percent of annual operating costs. State government ran up $6.1 billion in budget surpluses between 2000 and 2014, according to nonpartisan analysts. Only one-third of it, $2.1 billion, was placed in the budget reserve. The rest was spent. Officials have relied instead on the state’s great household wealth, which ranks – per capita – among the highest of any state’s. That wealth, coupled with a state income tax that could tap into it — theoretically — could handle any fiscal crisis. But state tax receipts fluctuate in Connecticut — where the economy relies significantly on Wall Street — by far greater amounts than in most other states. In 2009, during the depths of what some economists dubbed “The Great Recession,” the state’s general fund tax receipts fell almost $2.3 billion below the level anticipated in the budget. The largest Rainy Day Fund ever stood at just under $1.4 billion in 2008, an amount equal to 8 percent of operating costs at that time. By the time Gov. 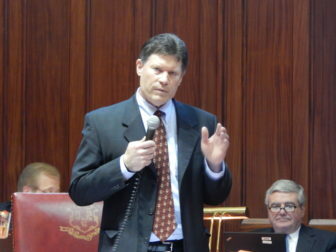 Dannel P. Malloy took office in January 2011, the legislature and outgoing Gov. M. Jodi Rell had emptied the emergency reserve, borrowed $1 billion to cover operating debt, and state finances still were on pace for a record-setting $3.7 billion deficit in 2011-12. But because of surging retirement benefit costs in the state budget and a sluggish economic recovery, Connecticut officials struggled to rebuild the state’s reserves. While things finally changed in April, Malloy administration officials and many economists warned that much of last fiscal year’s bonanza might be a one-time event, for two reasons. One, many households inflated their quarterly state income tax payment last December to take advantage of favorable federal income tax rules that expired after the 2017 calendar year. And, two, a federal income tax loophole that for years allowed hedge-fund managers to accumulate offshore gains without paying federal and and state income taxes closed last year, leading to a one-time surge in tax payments. Connecticut officials also were cautious Thursday not to exaggerate the value of the larger reserve. Chris McClure, spokesman for Malloy’s budget office, said the administration has “reduced reliance on shoddy budget practices,” paid off $1 billion from the past administration’s operating debt and made full contributions to pension funds that numerous governors and legislatures short-changed. “There is still much more work to be done to build on these successes to allow Connecticut to thrive and push the [budget reserve fund] balance above 10 percent, but Pew’s report shows the state is moving in the right direction,” he said. State finances, unless adjusted, are projected to run $2 billion in deficit in the first fiscal year after the November elections. And the problem grows by another $600 million one year after that. Comptroller Kevin P. Lembo, another advocate for savings reform, has said Connecticut needs to build a reserve of at least 15 percent to compensate for its highly volatile tax system. Pew analysts wrote Connecticut is not alone in beefing up its reserves. “Despite budget pressure from slow tax revenue growth and pent-up spending demands following the recession, policymakers in many states have made efforts to set aside money,” they wrote. Citing preliminary data from the National Association of State Budget Officers, they added that Connecticut and 29 other states added — or expect to add — to their reserves following the 2017-18 fiscal year, while another seven states foresaw a drop.